A crowd of some 100,000 people cheered the birth of what was then the largest movable manmade object in the world. Fast forward to April 14, 1912. Just four days into her crossing, heading for New York, the majesty of the seas, the Titanic, hit an iceberg and began her agonizing sink into the sea. 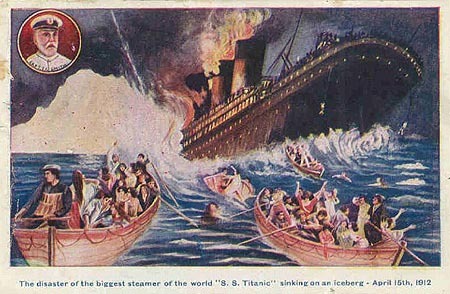 At 2:20 the following morning, the Titanic sank completely; 1,517 people died. There were 2,358 people on board. Nova Scotia, one of Canada’s Maritime provinces, was the closest city with direct rail and steamship connections. so recovered bodies were taken to Halifax, the capital, for burial. The Maritime Museum of the Atlantic in the pocket-size city has the best collection of wooden artifacts from the ship in the museum’s permanent Titanic exhibit. There’s a eerily perfectly preserved deck chair, for example, and large pieces of oak carving. The exhibit is powerful in its simplicity, and the clean, simple lines of the museum allow visitors to to reflect on the tragedy and the irony without distraction. For a strong sense of the moment, The Titanic Times is a very interesting read. To mark the years since a watch sailor called out, “iceberg right ahead,” and in recognition of the Titanic’s Irish heritage, the Titanic Museum Attractions in Pigeon Forge, Tennessee and Branson, Missouri, are giving away six, 11-day trips for two to Belfast. will sail to Belfast and visit the birthplace of the world-famous ocean liner. Both museums have Titanic exhibits shaped like the ship, and both try to bring the story to life through sight, sound and artifacts. In July, Titanic Museum Attractions will allow every guest who visits the museum to pay tribute to the passengers and crew by depositing a single rose petal into a container in the Memorial Gallery. On April 15, 2012 – exactly 100 years after the RMS Titanic was lost – each of the rose petals will be carefully laid onto the surface of the Atlantic Ocean directly where the Titanic sank. The sinking of the Titanic is more than an oft-told tale, but it’s lost neither its capacity to captivate an audience, nor its appeal to marketers.